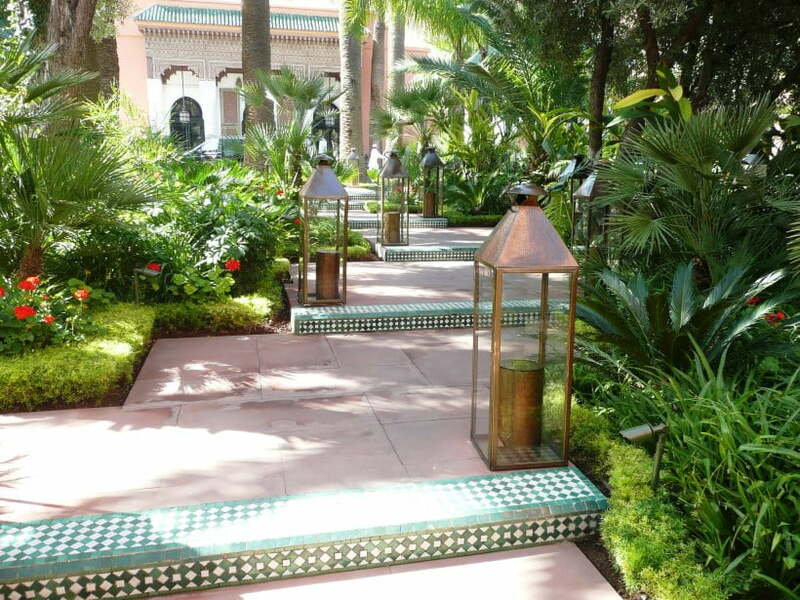 There were only two gardens that I really wanted to visit in Morocco: Jardin Majorelle and Hotel La Mamounia, both of which are located in Marrakech. Due to a bout of traveller’s tummy I nearly missed them both which would have been a great disappointment. However, after 36hrs confined to our room and some shuffling of the itinerary Craig and I finally set off for the Jardin Majorelle. Perhaps I was feeling more off colour than I realised but the entrance to the garden didn’t create a great first impression for me. 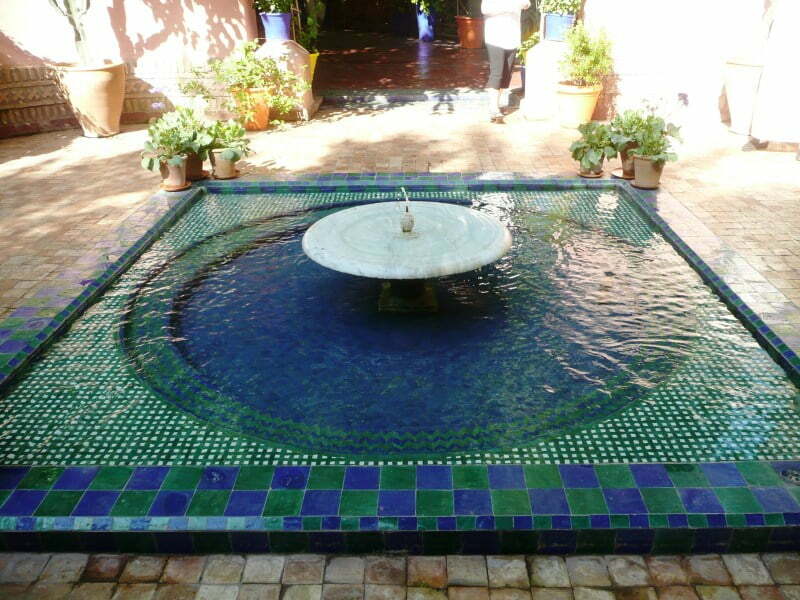 The courtyard featured a square pond which was decorated with blue, green and white tiles laid in pleasing geometric patterns but the traditional stone bowl with a fountain didn’t seem to suit the pond. Also the shape and scale of the pond didn’t complement the shape and scale of the courtyard. On venturing further into the gardens though, my spirits were lifted when to the left I spied a cathedral of green, created by giant bamboos arching high above the path, and to the right glimpses of the striking cobalt blue villa. 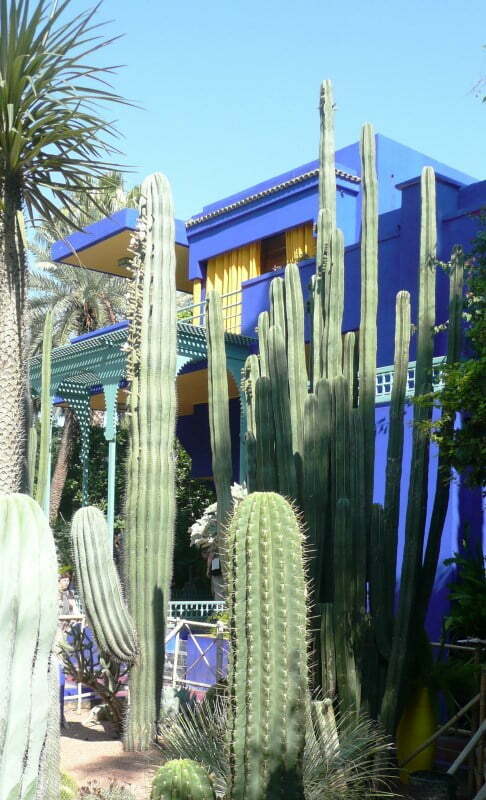 The creator of the garden was a French artist, Jacques Majorelle, who was inspired by a particular shade of blue, used by the Berbers, to create his own now famous Majorelle Blue. He used it on the studio/villa that he built and also on garden features such as fountains, ponds and pots. No matter how many images you have seen of it, nothing really prepares you for the shock of that blue, vibrantly contrasting with a cadmium yellow accent. One can only imagine what an impression it would have made on early visitors to the garden in the 1930s and 40s when photographs of the gardens would have be less accessible to most people. 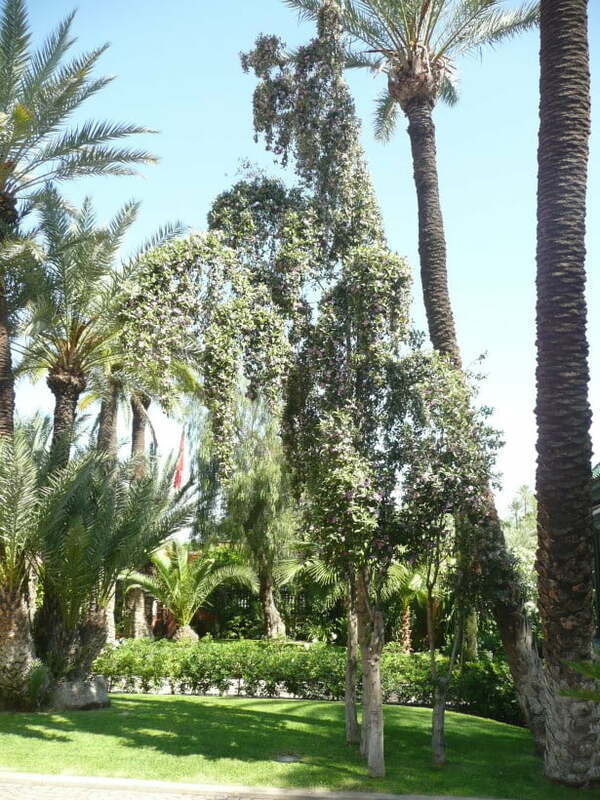 Majorelle was a plant collector and his collections of cacti, palms and bamboos dominate specific areas within the garden. 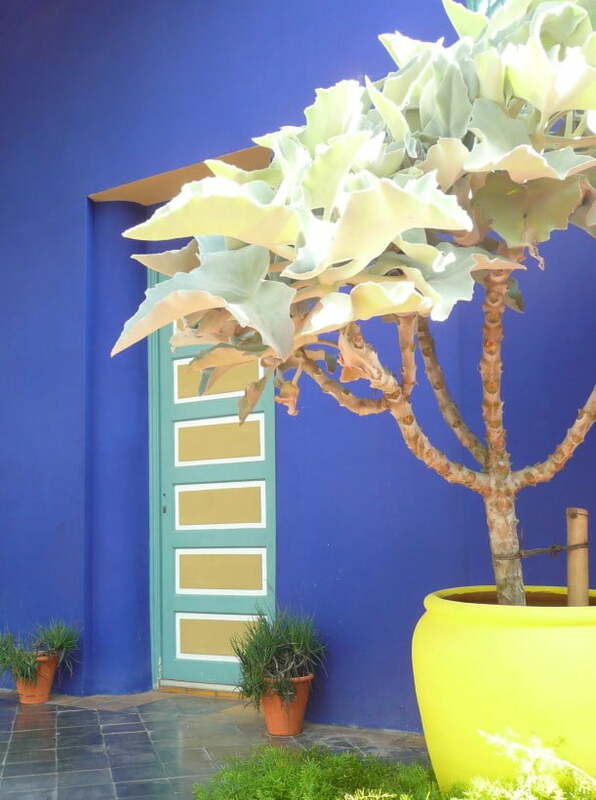 Terracotta pots, painted with Majorelle Blue, the cadmium yellow and various shades of orange, blue and green are used to link the different collections together and give the garden a sense of excitement and energy. 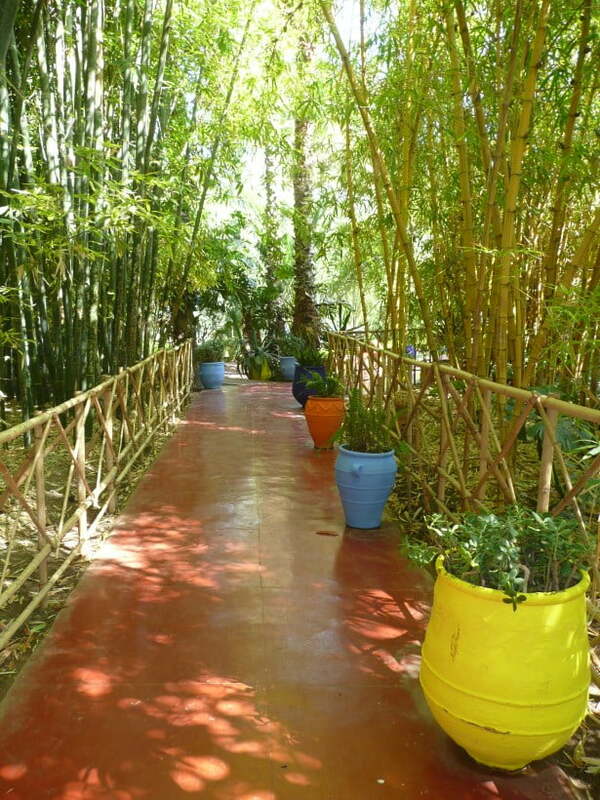 I think they look fantastic near the studio (now a museum), the cacti garden, the square Majorelle Pond and the rill, but in my opinion the bamboo garden would look as good, if not better, without them. 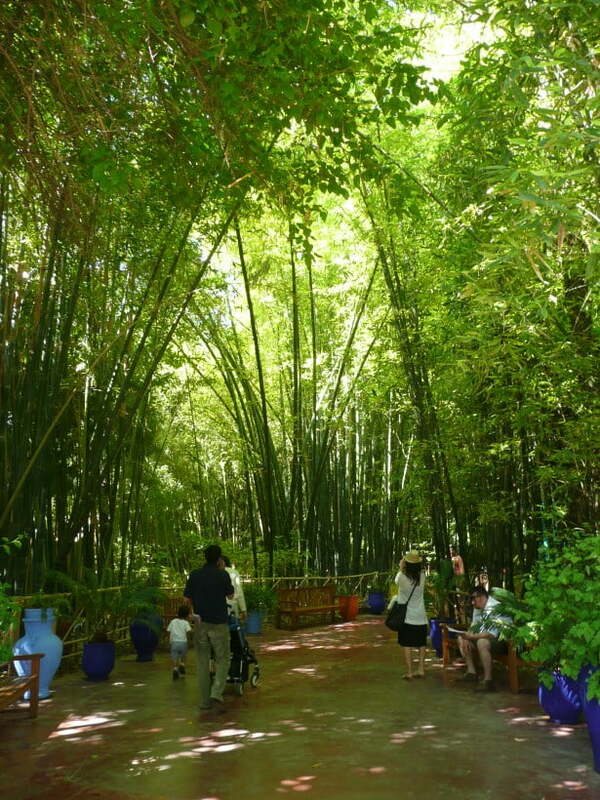 Have a look at the image of the bamboo garden (right), and screen out the pots and see what you think. I loved the way that you emerged from an aisle cut through the bamboos into a nave like space crowned with a dome of dappled green. The palm garden was shaded by a majestic camphor laurel (Cinnamomun camphora) and contained another of my favourite features of the garden, a sinuous brick path. The curves were accentuated by the fact that the path was raised and the garden beds were sparsely planted. According to Monty Don in his book “Around the world in 80 gardens” the raised paths hark back to the traditional agricultural practice of flood irrigation. To my mind the raising of the path is a beautiful example of ‘form follows function’ but the design of the curves has the signature of a creative mind. 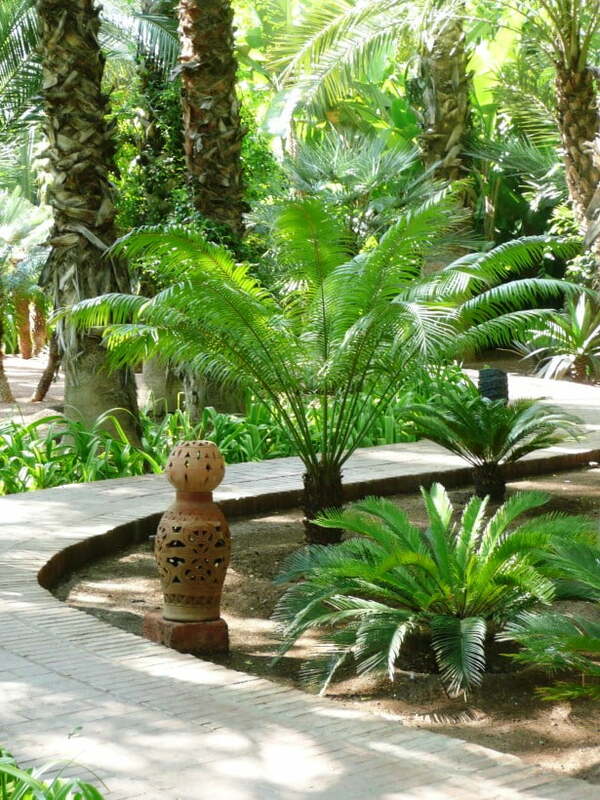 Although some of the decorative features of the garden are Moroccan, I was struck by how oriental other aspects were. 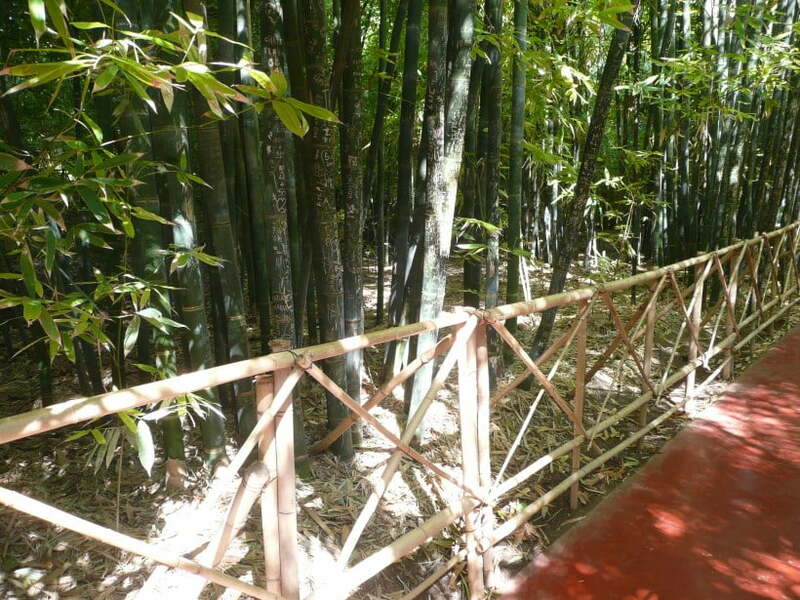 For instance many of the paths are edged with delicate bamboo railing and it seemed to me that there was a very strong Asian influence in the design of the pavilion, enhanced by the surrounding bamboo. Towards the end of his life Majorelle was forced to sell the property due to ill health and lack of funds and it languished for the next twenty years or so. In 1980 a hotel development was proposed for the site but fortunately Yves Saint Laurent and his partner Pierre Bergé bought the property and saved it from destruction. With a team of gardeners they restored the gardens and introduced many new species. Very few plants were in flower but statice (Limonium) and a double Brugmansia provide a sprinkling of purple, and the pergola over a walkway was shrouded in wisteria which would have added to the purple theme in spring. The buildings in the surrounding streets are a fairly monochromatic dusty, earthy pink colour but within the garden walls is an oasis of vibrant colour and refreshing greenery providing both stimulating and restful areas to enjoy. 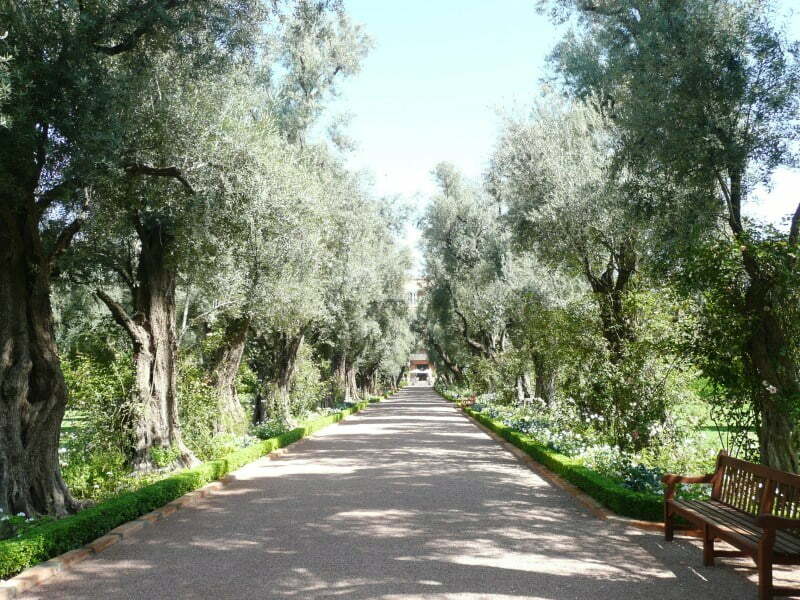 Next morning as we left the city we were able to detour to the Hotel La Mamounia. I didn’t know what to expect but I had read that the hotel was set in 8 hectares of historic gardens so I thought it would be worth a look. It isn’t the sort of place you can just wander into, so morning coffee seemed liked a good reason for a visit. Once we had passed through the gate we were greeted with lush gardens dissected by an inviting stepped path leading to the forecourt. The risers and treads of the steps were decorated with green and white mosaics which created strong, repetitive bands across the path and accentuated the gentle rise. Gorgeous oversized lanterns also punctuated the journey and drew the eye along the path. The garden beds were planted predominantly with palms and cycads, with red geraniums providing a splash of colour. The humble asparagus fern that we regard as a weed was used to great effect as an edging plant and ground cover. 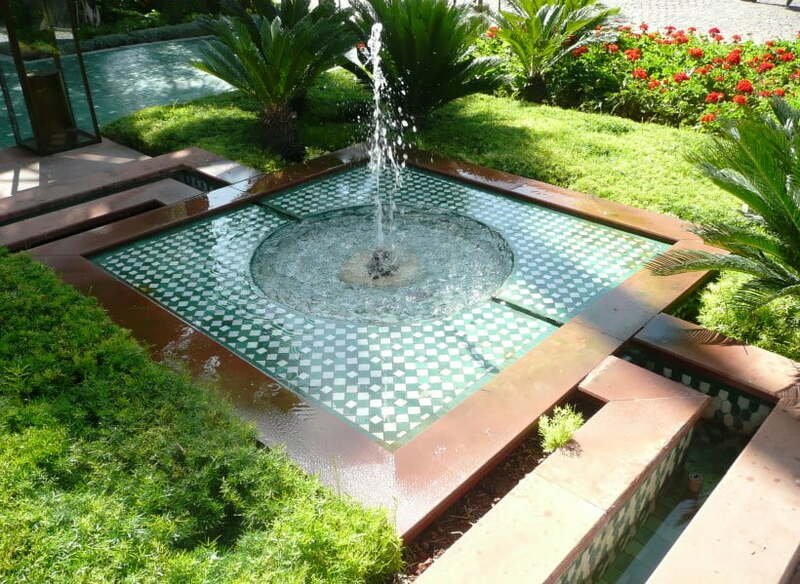 A splendid pond with a fountain and mini rills was nestled into the greenery. 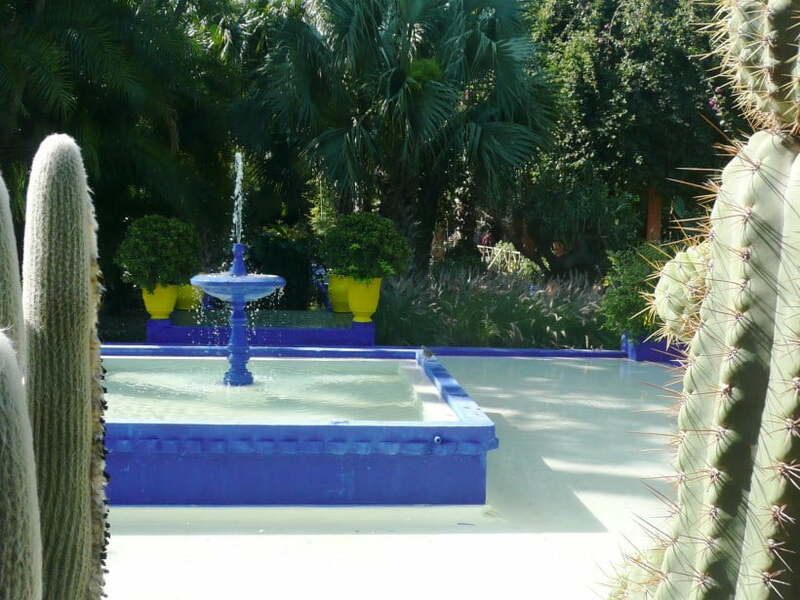 Although similar in size and shape to the one at Jardin Majorelle, this one looked as though it and the surrounding garden had been designed to complement each other. It would be interesting to know who designed the ponds; did one inspire the other or were they both inspired by another pond. Majorelle was apparently commissioned to work on the La Mamounia restaurant ceiling so I wonder if he had any influence in the garden. The sculptural forms of very old olive topiaries added drama to the forecourt and in amongst the palms in the front gardens I noticed a little clump of Norfolk Island Hibiscus (Lagunaria pattersonii) in flower. They had been pruned rather drastically with the central leader having been removed which seemed to have caused the trees to grow very tall and narrow with blossom laden branches cascading down from high up in the tree. The effect was rather charming. 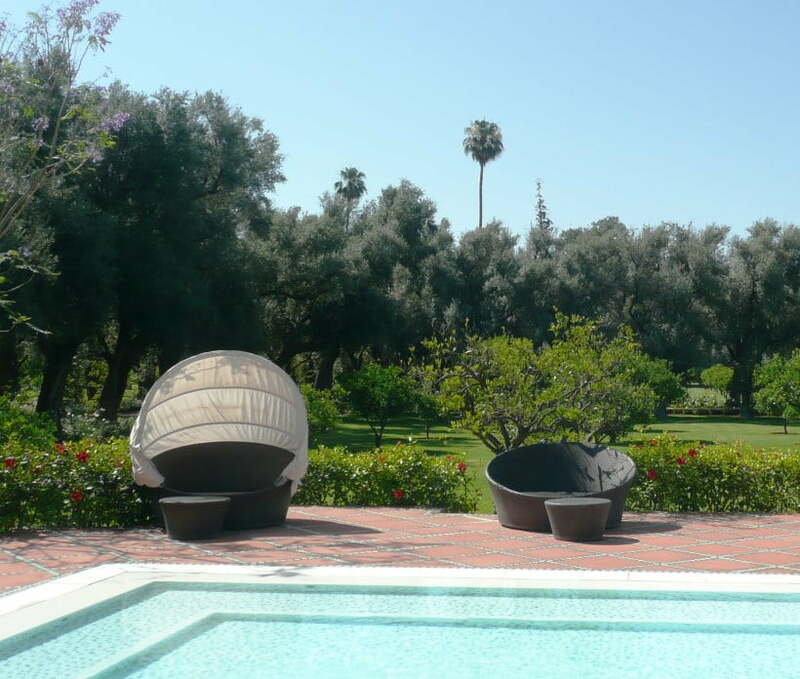 At the back of the hotel a sunny terrace overlooks the extensive gardens and huge pool. 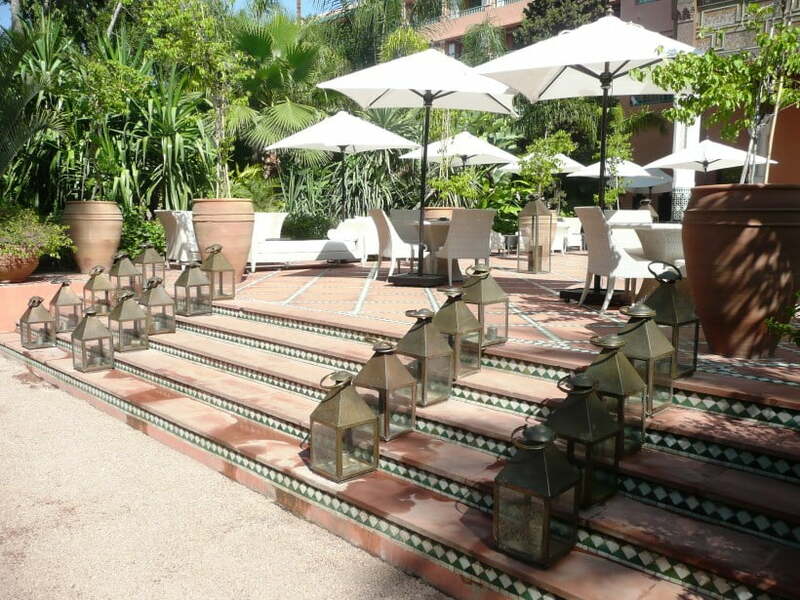 Here the steps were again accentuated with mosaics and the clever use of lanterns. How stunning it must look at night with the lanterns lit. The gardens are laid out in a formal pattern with a main central axis leading off from the terrace, intersecting with smaller axes. The main axis seems to go on forever and when you arrive at the pavilion you think you have reached the end only to discover that path continues on the other side. 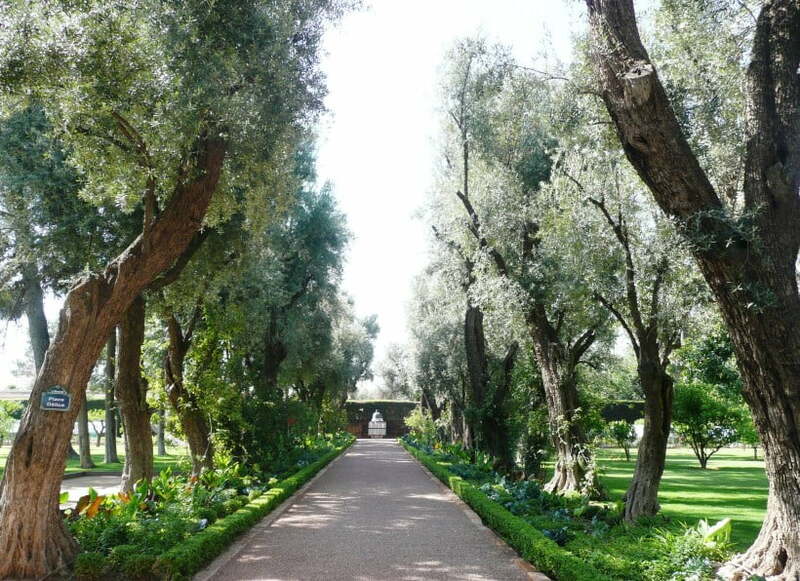 The borders of the path are planted with an avenue of ancient olive trees, climbing roses, cannas, white shrub roses and cosmos and scattered amongst them are red cabbages and decorative vegetables. There is a very productive vegetable garden off to one side at the end of the central path. On the side axes are beds of cacti and succulents, palms, red roses and flowering perennials including shasta daisies and geraniums. 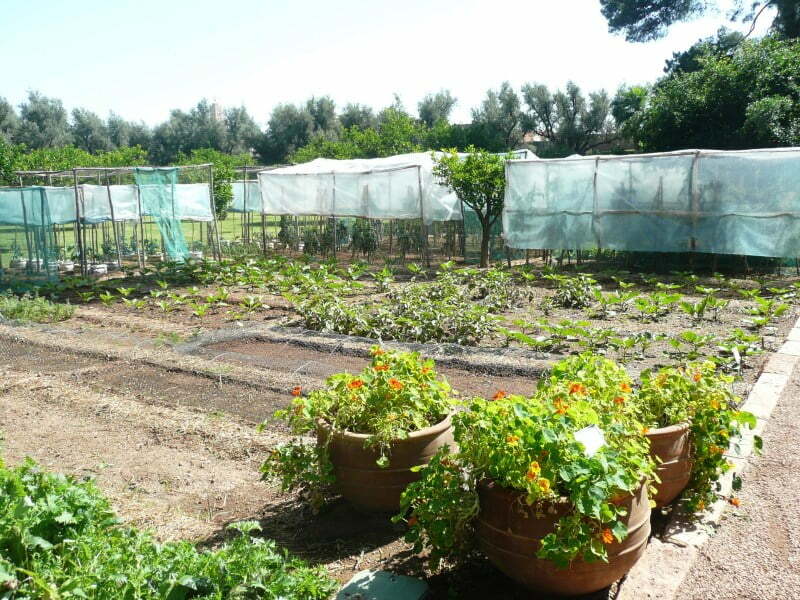 A large part of the garden is planted with a citrus orchard which is attractively bordered by olive trees. We virtually had the whole garden to ourselves and it was so tranquil and relaxing that we forgot that time was slipping by. We spent so long wandering around the grounds that we didn’t have time for coffee before continuing on our journey. I’m glad that I saw both gardens because although many of the plants were similar, the size and style of the gardens was completely different but both were immensely enjoyable. Thanks for taking me back to Morocco, Linda, and without the ‘tummy trouble’! 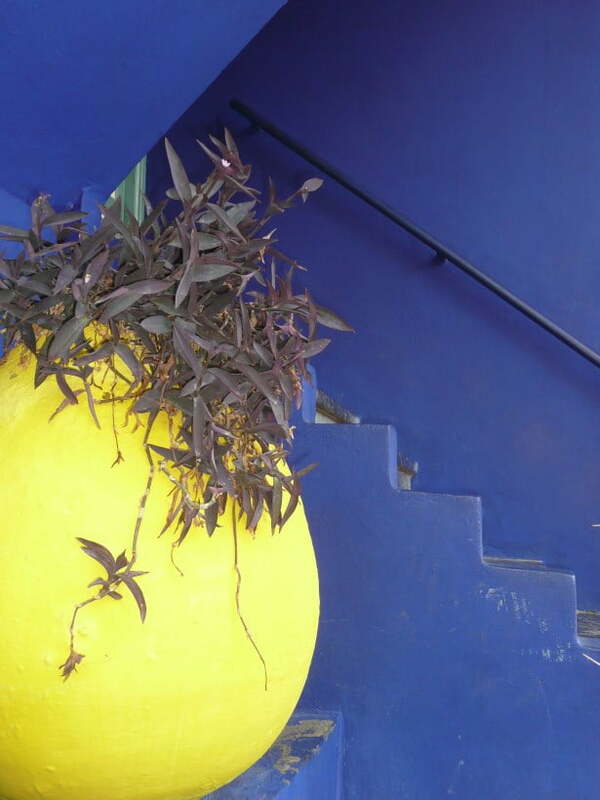 Re Majorelle, I agree with your ‘too many pots’ assessment and I see a lighter blue has also unfortunately crept into the colour scheme. 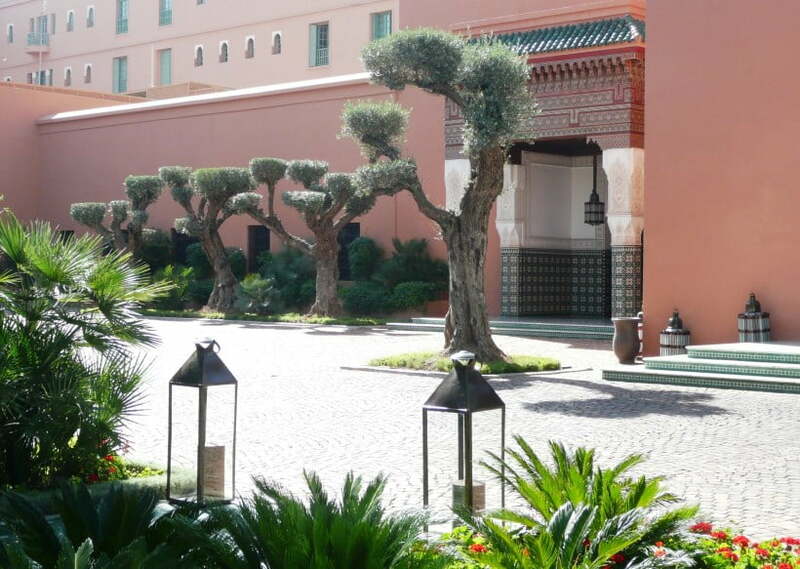 And that front entrance to Mamounia is perfect and a good lesson in path design – the objective (the building) is clearly visible but the path makes you want to enjoy the journey rather than just arrive. Good point about the destination at the end of the path being visible, Catherine. I can’t think of a more enticing entrance that I have seen. Wonderful to read a review that assesses the gardens thoughtfully and critically. Think you’re right about those pots.. So what do most of the gardeners in the Jardin Majorelle say during there work day. 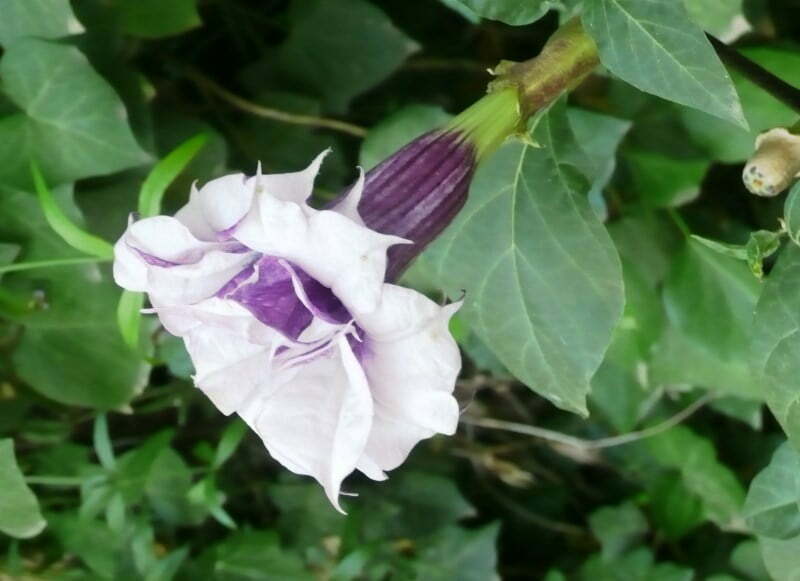 Thanks Linda – nice piece: one comment: that’s no double Brugmansia, it’s Datura metel, a relative with ‘upright’ (v hanging) flowers and a small sub-shrub. Thanks for clarifying that Stuart. I must confess that I was unsure if it was a Brugmansia or a Datura and I was thrown by the fact that the flowers appeared to be hanging down. Since reading your comment and looking at some images I can see that Brugmansias don’t just point downwards they really hang down, almost to the point of drooping. Hopefully I will be able to distinguish the two in future!